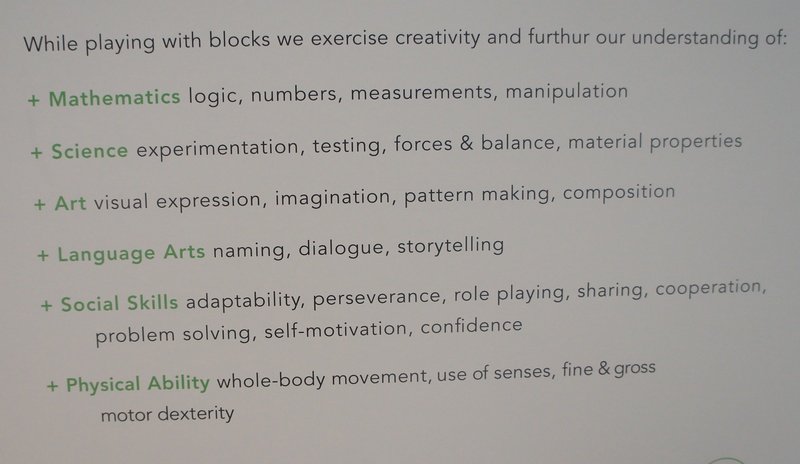 A Couple of Months Into Our Homeschoool Year – Time for Re-evaluation! 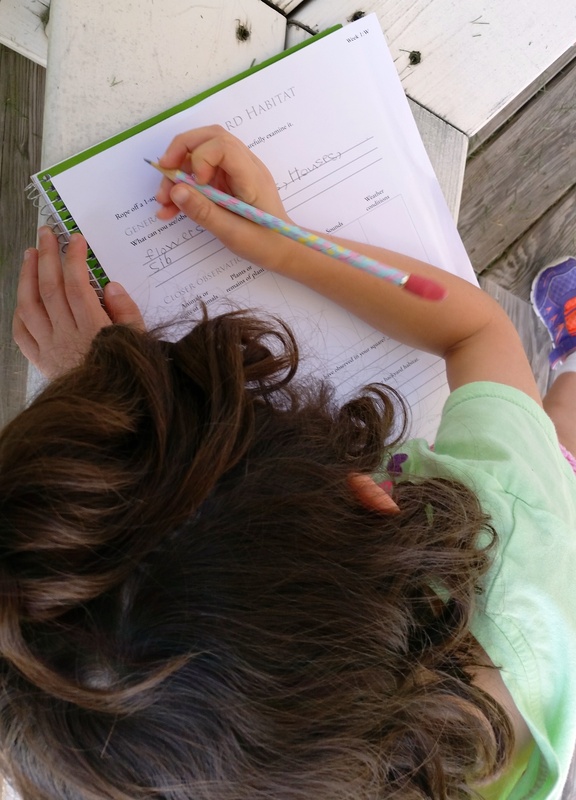 We are now about 2 months into our new homeschool year, and I am already needing to re-evaluate our plan! By and large, I think our overall schedule was a good idea. The curriculum choices we made were good ones, but I think I grossly under-estimated how much time things would take. Also, my work hours have picked up quite a bit, and that has cut into my time to participate in some of the hands-on work I wanted to do with the girls. We also started going to a weekly homeschool program – which works like a Co-Op but brings in professionals from the area to be the teachers of the classes (meaning I don’t have to volunteer!). So far, the girls have enjoyed the first session, so we are going to continue with it this fall. I’ve been making my girls do the optional “homework” sent home by these teachers, so that takes up time as well. So, my plan for today is to rearrange our “planner spreadsheet” and stretching out our assignments into hopefully a more manageable schedule. How are you doing? 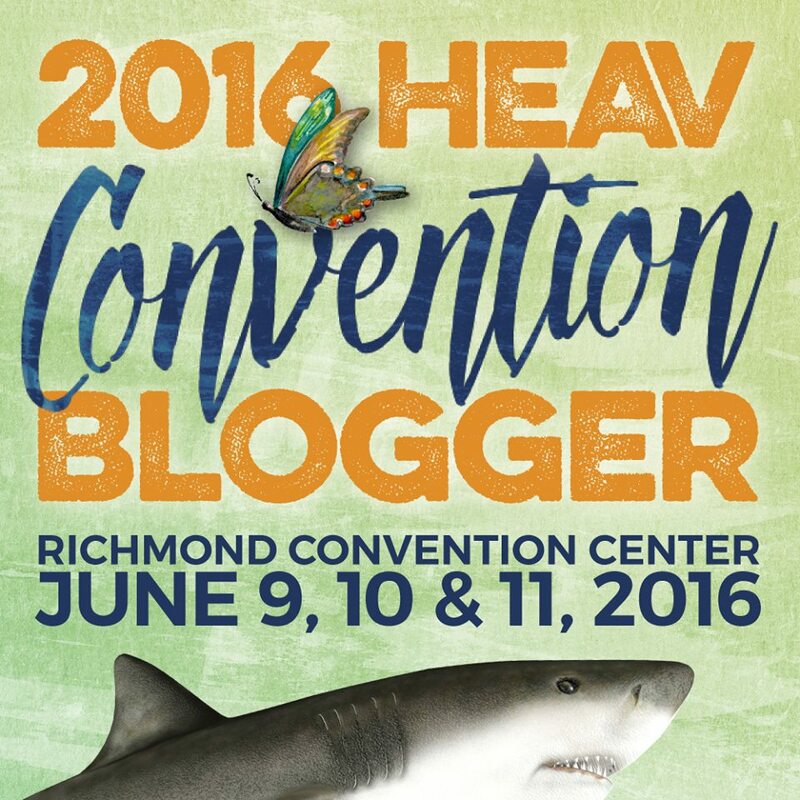 Have you re-evaluated your homeschool plan already? What are you changing or not? 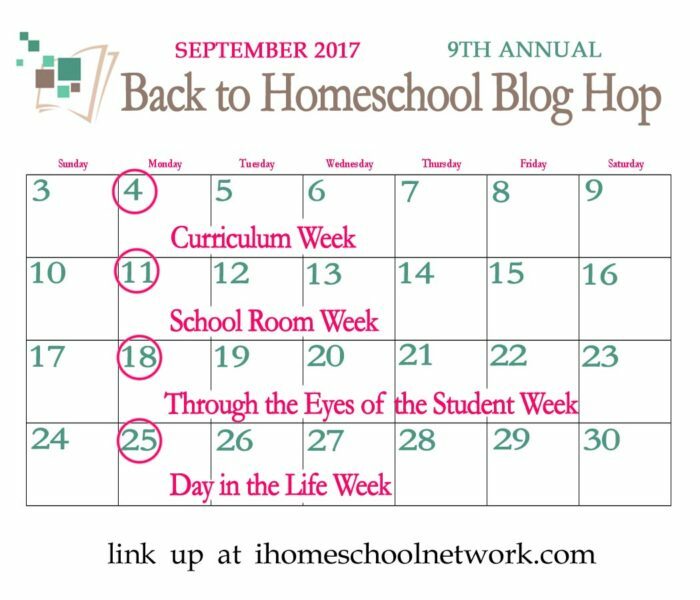 Getting Ready for 2017-2018 Homeschool Year! Yes, the school year has finally arrived! Where did our summer go? Well, I’m not sure about you, but our summer was decimated by our move. Starting early June, we dealt with combining two houses into one (turning our furnished rental property into an unfurnished rental property) and then purging, unpacking and then purging more. And then more. And even more. Truly. After all I purged before our move, we still looked like hoarders when trying to squeeze everything into this 1200 square feet townhouse. We must be ruthlessly organized to survive in this space. It’s honestly been pretty painful dealing with all that. I can say now that there is not one area of our lives and not one box that we did not cut in at least half. I still really like the place we are renting though. Great landlord, with a good, functional layout, AND he completely renovated it before we moved in. 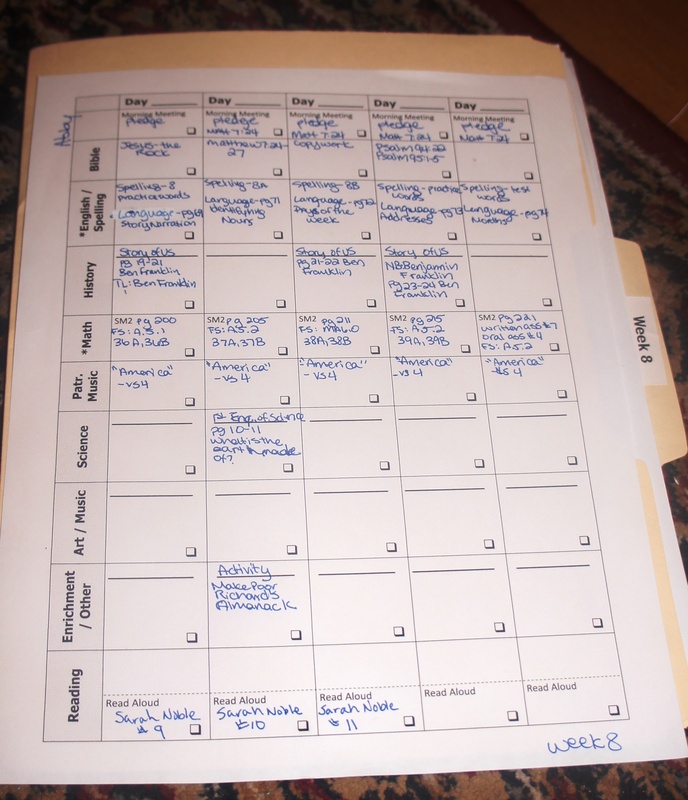 In the midst of dealing with all of that, I began to organize for this homeschool year. Thankfully I had purchased most of it before our move, but I did have to pick up some odds and ends that were forgotten. Because I am continuing to work and homeschool, we have to rely on independent-type homeschool work, so they can complete the bulk of their work while I’m on the phone with clients. Math– We are sticking with Teaching Textbooks. Our oldest is in the middle of Level 6, our youngest will start Level 5. Spelling– I’ve let my oldest out of doing formal Spelling now, though I did tell her I would start marking all spelling mistakes in her work as wrong. My youngest will continue with SpellingCity.com, using Abeka spelling lists. 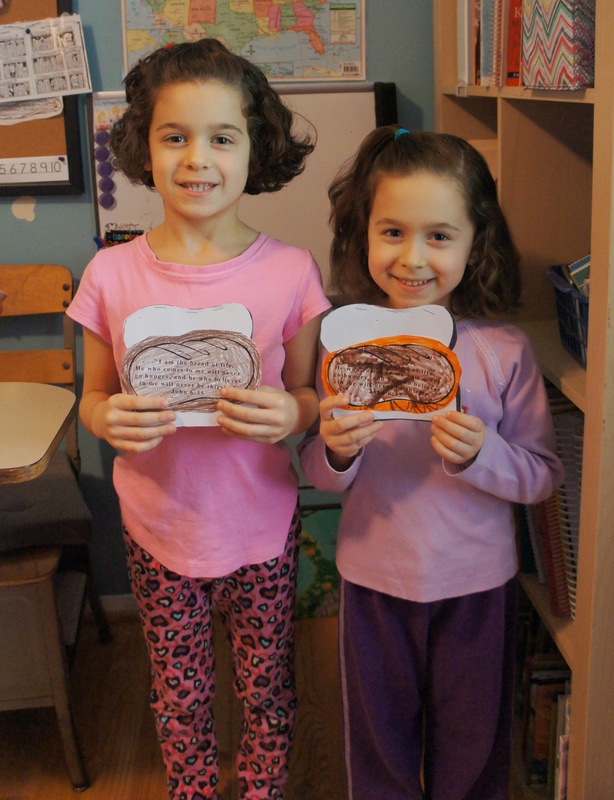 Writing, Reading/Literature– Our girls are voracious readers now, so that’s not a problem for us. However, we’ve never done a formal reading comprehension program. I found the Apologia Readers in Residence program that we are going to try this year. We are also trying their Writers in Residence program this year as well. We will do this four days a week. I got these great books from Amazon, for my oldest. I want to work on her reasoning and logic skills, since she’s entering middle school age. We will do one short lesson a day, four days a week. I thought it important to move to a more formal science program this year. 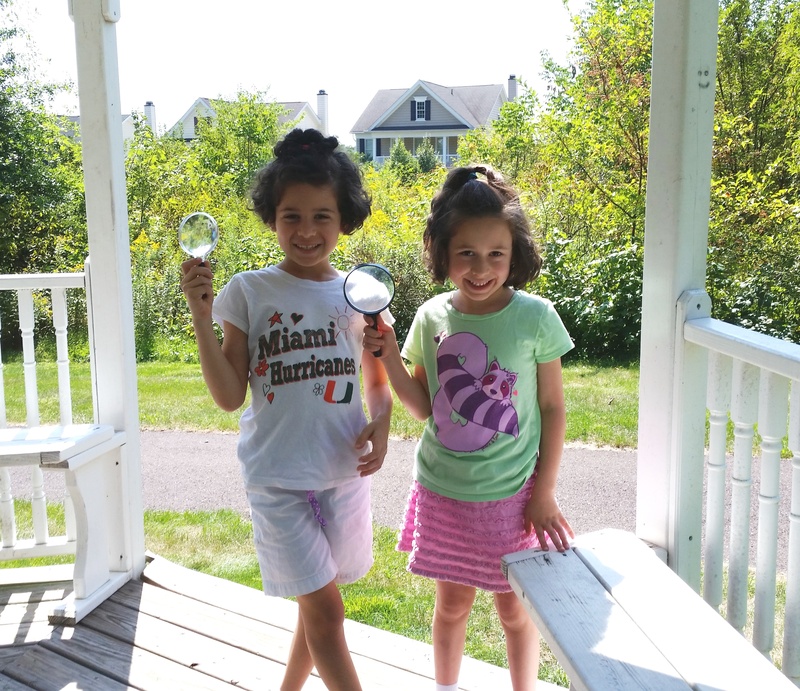 Neither of my girls could agree on what to study, so we’re letting them each study what they want. So my oldest will be doing Apologia’s Zoology 3 (land animals), and my youngest will be doing Apologia’s elementary Chemistry. 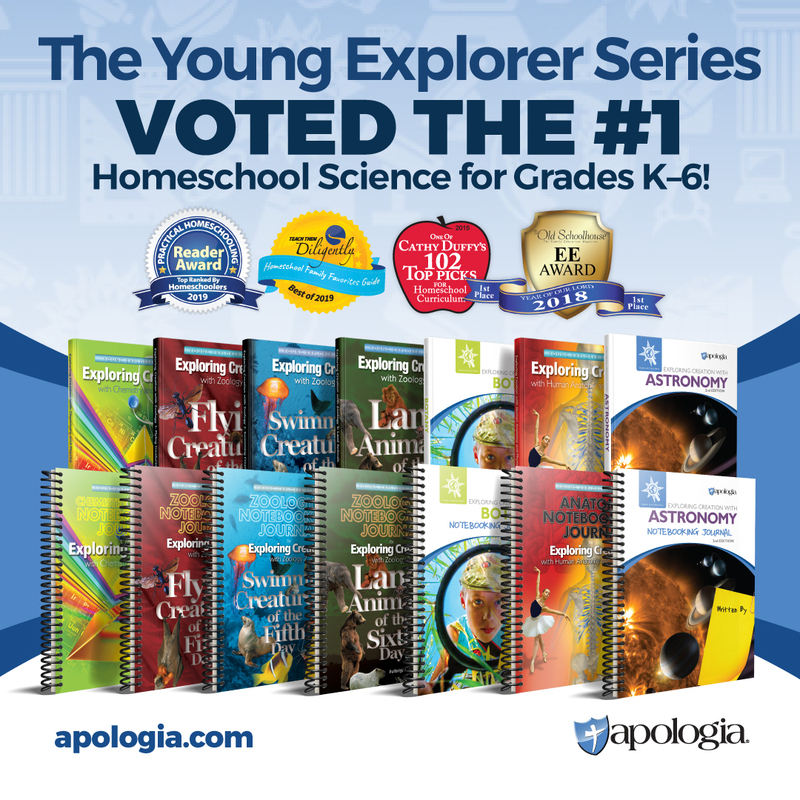 We purchased the books and workbooks from Apologia during a big sale. Even better, I found kits with everything you need for the experiments of each. Everything is in in a box, organized in bags by lesson, and labeled. It feels completely magical. Do you know how much I love having things done for me???? Anyway, I will be helping them get through the book work portion, and Hubby will help them with the experiments twice a week. The books list this as two times a week, but as much as is listed, the work might have to stretch over four days. I found these cute devotional books for the girls to use for their devotional time this year. I saw the “Big Book of Animal Devotions” at a used curriculum sale, and thought it it would be perfect for my oldest who is studying zoology this year. While unpacking, I found the second devotional (which we have never used) and my youngest decided to use this year. Our main focus/theme for this year will be going back to history. While I personally LOVE My Father’s World and their program, my daughters don’t. I’ve been informed that it’s “babyish.” I don’t agree, by the way, but we used it for K-2nd, so maybe that’s why they think that. Last year, we used a lapbook from Home School in the Woods elections, which my girls loved. I think it spoke to their crafty side. They wanted to do that again. So, I have cobbled together several products from Home School in the Woods, to replicate MFW’s Creation to the Greeks program. 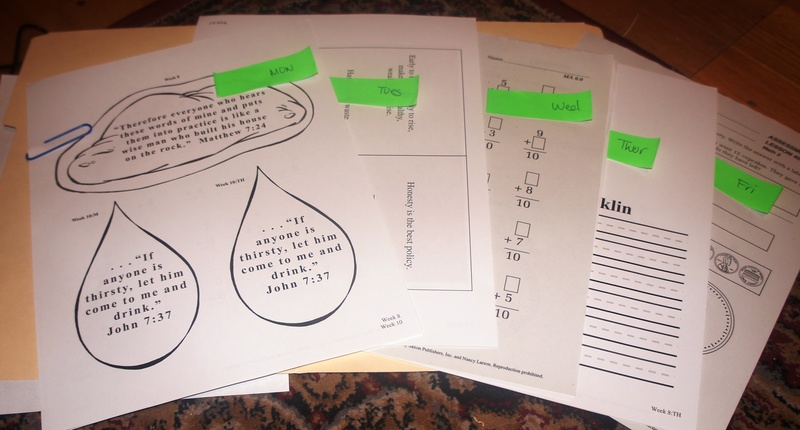 This year, we will be using their Timeline, the Old Testament Activity Pack, and their Project Passports for Ancient Egypt and Ancient Greece. So, to go along with that, I have started collecting books to go along with these themes. I purchased a few at a used curriculum sale, and many if not most of the resources we need will be coming from local libraries. I’ve also been using Paperbackswap.com to fill in books I couldn’t find in the libraries. So, that is our “school plan” for the year! This does not include all of our other activities, which I will cover in another post! 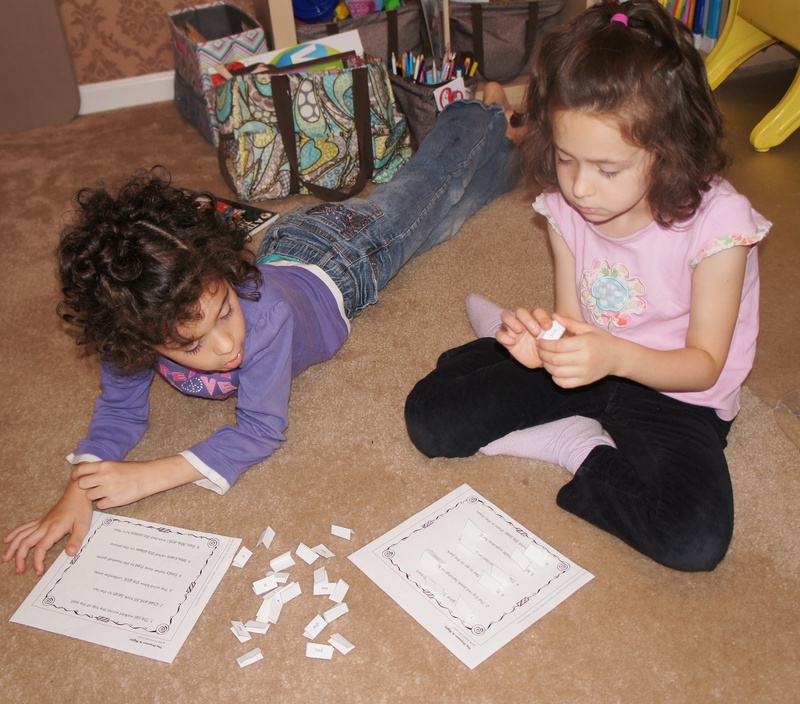 This post is part of the Back to Homeschool linkup from iHomeschool Network! Click over to read more curriculum choices from our fellow bloggers! Mom is stressed, non enjoying homeschool, dreading doing school each day. 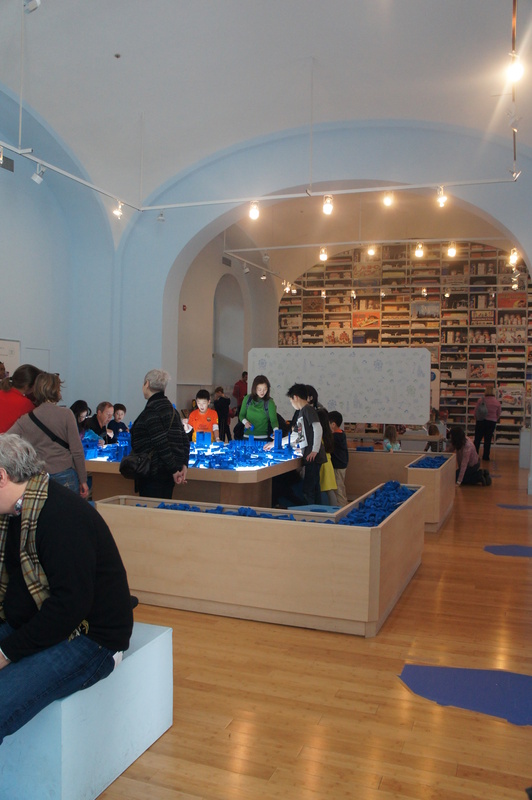 Kids are listless, and not wholeheartedly diving into the lessons. The kids keep asking, “Can we do something else?” and the mom says “No, we don’t have time because we’ll fall behind on what we HAVE to do. Homeschool is no longer fun and interesting. 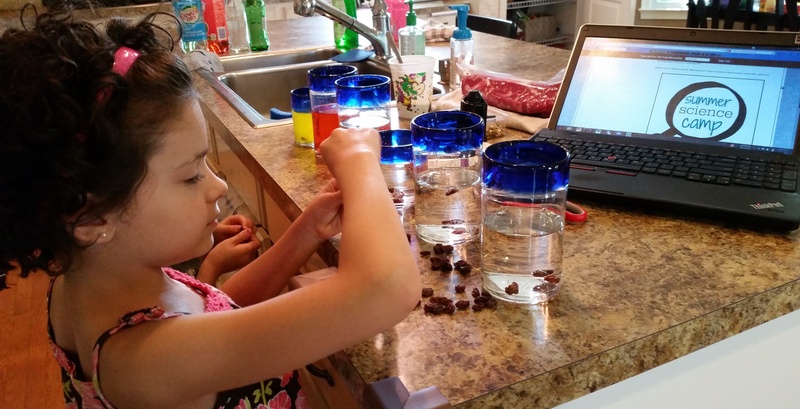 Clearly, when homeschool is no longer a delight but drudgery, it’s time to mix things up. First, analyze what things DO work! There is no reason to fix what’s not broken, right???? Teaching Textbooks is really working for us this year. Both girls are doing it now, and doing well. Life of Fred is awesome. We love it in this house, and do it three times per week. Our Math Fact Songs daily are working great, along with our Math Wrap-Ups. The girls are really getting their math facts drilled into their heads. So far, we are covering addition, subtraction, and multiplication. Division will be added sometime in the Spring. SpellingCity.com is sorta working. It works when the girls decide to be slightly interested in spelling at all. Right now they just don’t care. I’m still working on that. The grammar lessons that I am putting together are working. They are a ton of work to find and organize all of the resources I’m using, but the girls are truly learning and learning the grammar well. As long as I stay on top of it, which is always an issue! Learning Action Verbs by Creating an Action Verb Path! Other things that are working: Homeschool Co-Op. I’m not completely thrilled about Co-Op, honestly. Frankly, it’s a really long drive, I was assigned one too many classes to assist in, and I go home completely exhausted each week. BUT, the girls love it. They are getting really good classes there – Spanish, science, PE, art, etc. So, we’re going to keep with it for another semester. Ballet is also working for us. 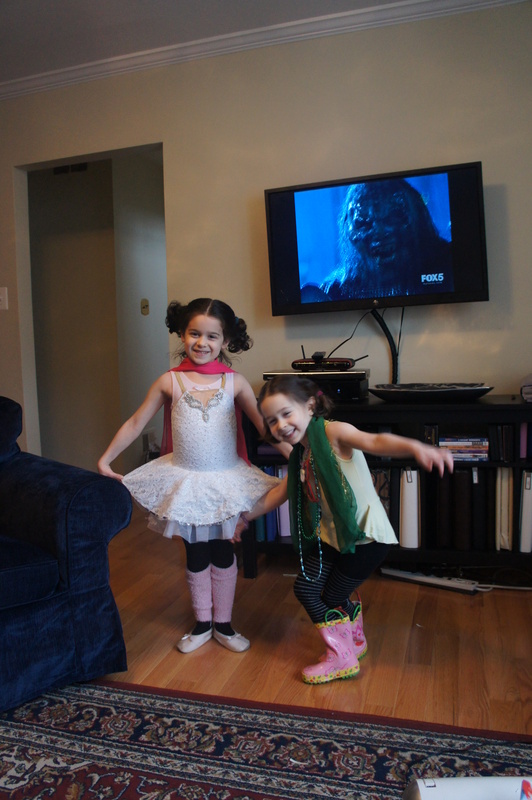 The girls love to dance. At this point, we asked the kids, “What do you like about what we’re learning?” “What do you like about what we’re doing right now?” The only thing mentioned from the MFW Exploring Countries and Cultures curriculum were the missionary biographies. Notably, nothing else was mentioned. I know, it’s not rocket science, right? Up until this year, they were so happy just to learn, they really didn’t care what. This year, they are starting to have opinions. Strong ones. First, of all, they wanted MORE science. “Real Science,” as my youngest put it. Lots more science. I started to ask what kind of science, and they even had thoughts about that – they want to learn about how the body works, and about nutrition. More reading of real books. More “real art” (again, from my 6-year-old) not silly craft projects. More focus on girls (more about that later). And holy heck, they want even more math. !!! Are they kidding me??? Clearly, this was a conversation that was long in coming. Stay Tuned for Part 3 of this series, Mid-Year Change of Plans! So, this year in the My Father’s World plan, we are supposed to do the “Exploring Countries and Cultures” year. 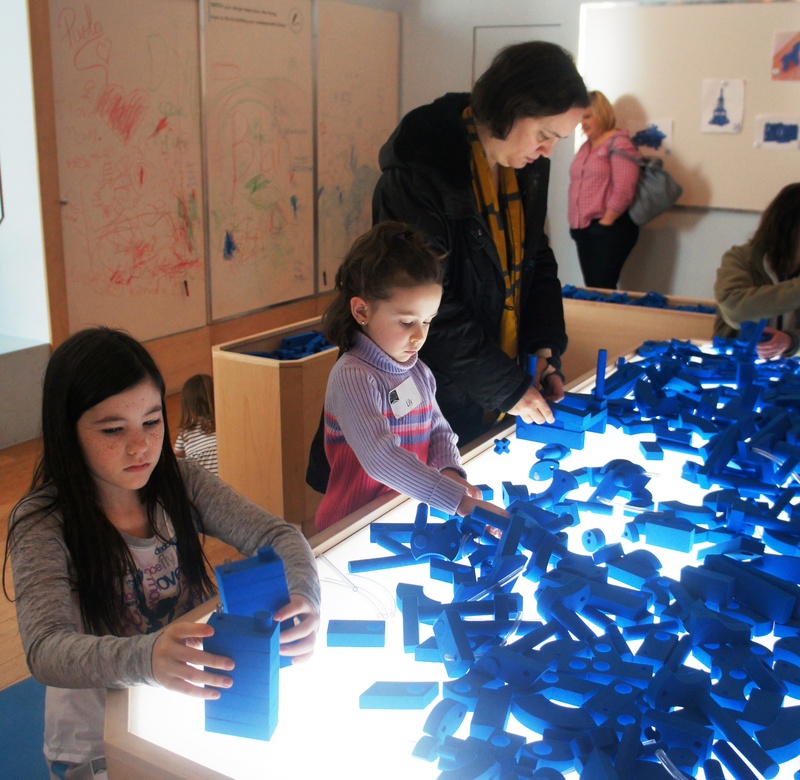 It’s based on the family group learning together, which I’m a huge fan of. It focuses on World Geography. Also focuses on the biographies of missionaries and missionary work around the world. We have LOVED these stories, and I think this is a unique and novel approach. 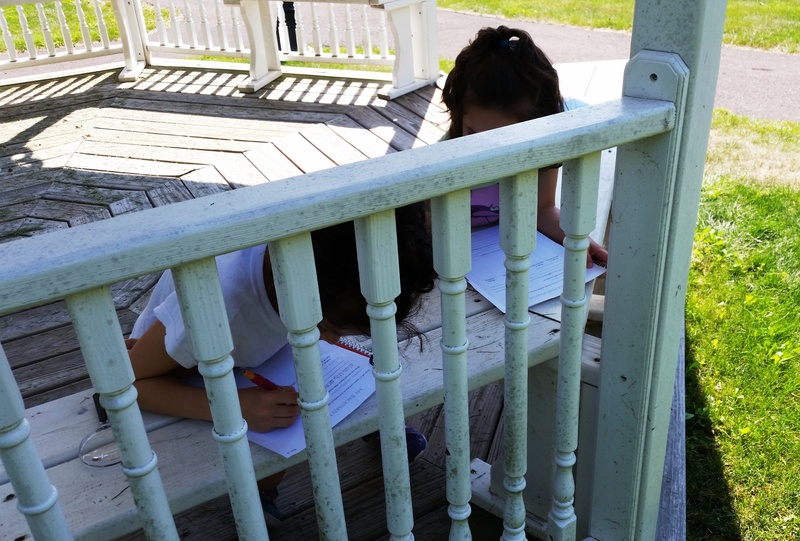 Worksheets on Our Backyard Habitat. I have fought it, and fought it and fought it. I love My Father’s World, the company, the concept and the organization of it. It’s been absolutely perfect for us, until now. 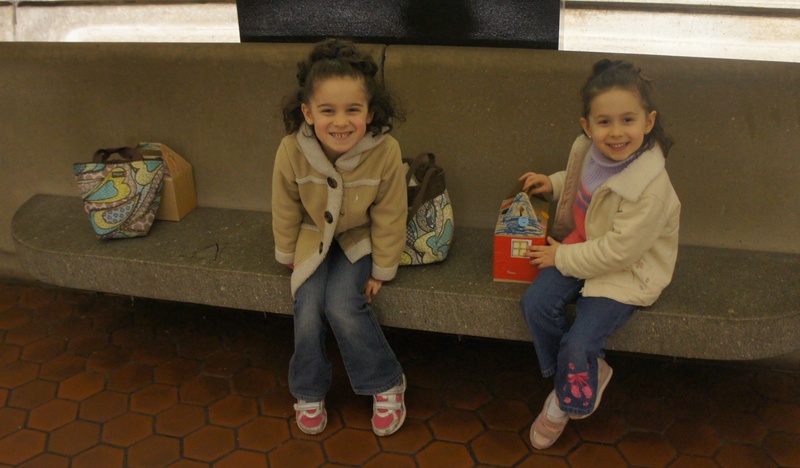 I thought it was just me, but my girls started acting un-enthused for school. I thought I was going crazy, until I saw others also mention it on Facebook. It feels disjointed and choppy, my girls hate the science portion and think it’s lame. And the worksheets (country pages) just feel like worksheets for worksheets sake. We have spent the last few months going through the motions forcing this down our throats AND IT IS NOT WORKING. Which of course started my entire freakout! Absolutely nothing this year has worked according to my plan. My old way of doing homeschool up to this point, DID NOT WORK NOW. And frankly, I don’t know how to homeschool (for me!) any other way than what I was doing! All my grand designs were going up in smoke. I timidly mentioned to him that our homeschool plan wasn’t working. That it felt choppy and disjointed and uncomfortable. Even those online who say they liked this year’s program admitted to heavily supplementing it. I felt discombobulated and disorganized and completely outta control. I said this timidly, because I knew what this was going to mean. This was going to mean spending money. But, when I told him that I needed to change things up, I think he felt relieved. He wants homeschooling to work for us, he wants for his wife to not be stressing about homeschool so much, he wants to come home to a wife and kids who are excited about what they are learning every day. His “permission” to change, gave me the opening I needed to be willing to put this curriculum down and find another way to do school. Stay Tuned for Part 2 of this series, Mid-Year Change of Plans! So, it’s time to talk curriculum! This year I was in quite a conundrum. There was just no way I could handle two full curriculum programs in the limited time I have to teach this year. I need to streamline my teaching, while still giving them a solid well rounded education. So, after staring at the curriculum for HOURS (or what at least felt like hours) I finally came to the solution. I turned Adventures into the “family-style” curriculum – similar to My Father’s World Family cycle. Since we’ve already done My Father’s World’s 1st grade program, and because we turned it into a full family affair, I just couldn’t see the point of doing it all over again. So, we’re going to do the full Adventures program, and use MFW’s 1st grade program for the phonics and reading program. So we will do all of the Adventures together. Our oldest is using Saxon Math 2 for math, and Spelling by Sound and Structure and First Language Lessons for her Language Arts. Our youngest is using MFW for the reading program, and Saxon Math 1. And I am so STOKED! Seriously, the Adventures program year was what drew me to My Father’s World in the first place! And what better place to study American History than right by Washington, DC!!! We already have our first field trip planned and I am so excited! Last year we learned a lot about our children’s learning styles. One is HIGHLY verbal, and one is HIGHLY auditory. 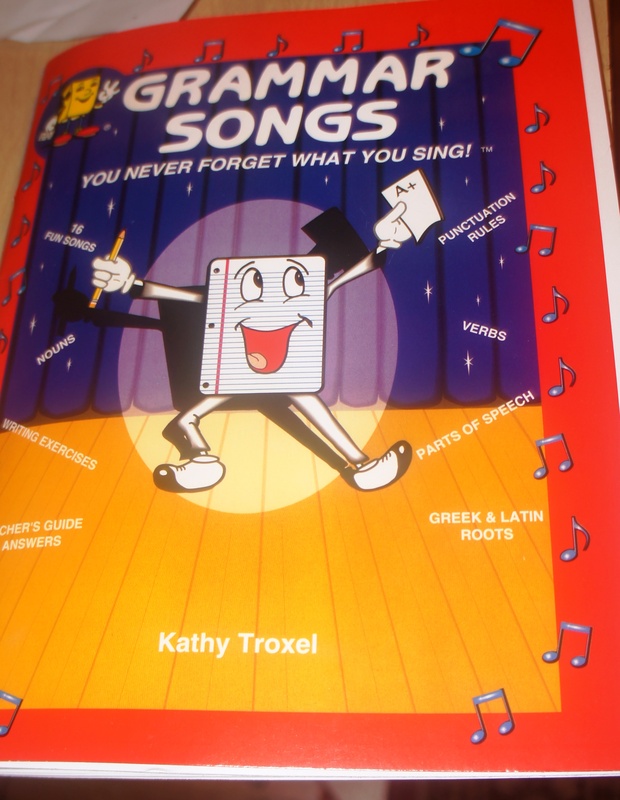 So, at convention this summer I went just a little crazy when I found all these song books with CDs. Our oldest is also and extremely kinesthetic learner. Which is a bit of a challenge for me, since I am not. I spent a lot of time last year trying to come up with new and different ways to make learning “active.” So, this year I bought some Bananagrams to use for Spelling. Anything I can do to make that more interesting and fun, right? And finally, I do plan to add in some items from Scholastic Teacher Express. They hold $1 Deal Sales a few times a year, and well, I couldn’t resist. The stuff was so darn cute, and my girls tend to really like it. And heck, it’s a dollar! 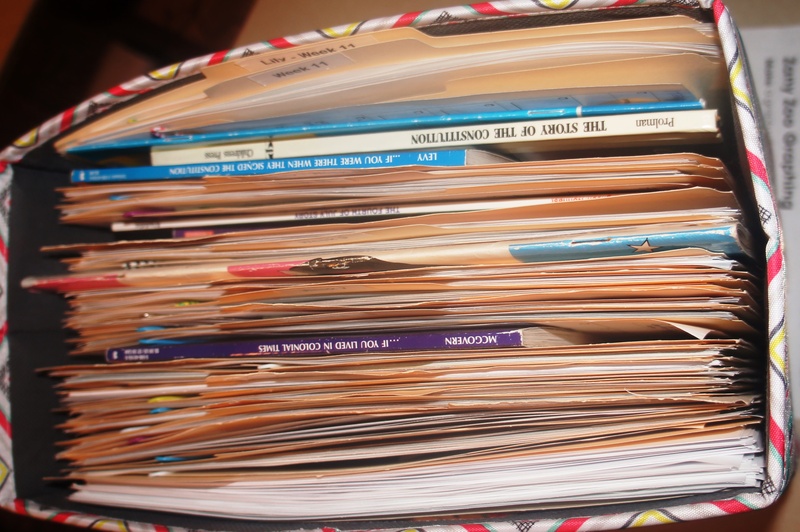 Here is the first half of our folders for the year (the rest are in another bin on top of our bookshelf). 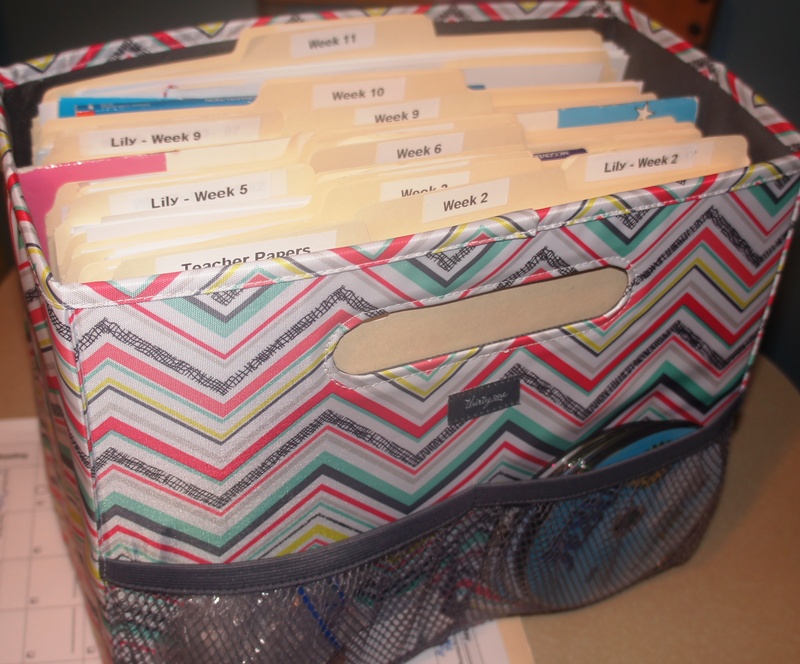 Each child has her own folder, but both folders are organized together. The front pockets hold the videos we own that already match our reading material, and the other holds paper clips. I went through a LOT of paper clips. Any books that we already own that match what we’re studying? They are sorted with the folders as well. That way I don’t have to go looking for them later! I sorted each day’s handouts and clipped them together. I know I said last year that it was complete overkill, but ya know what? I also never had to think last year about what needed to be done that day. I just pulled out that day’s stack and did it. So, I ended up doing it again. With two children, it just felt necessary in order to make sure we didn’t miss anything. I wanted to pull my hair out the entire time I was doing it, but I know it will be worth it during the year. 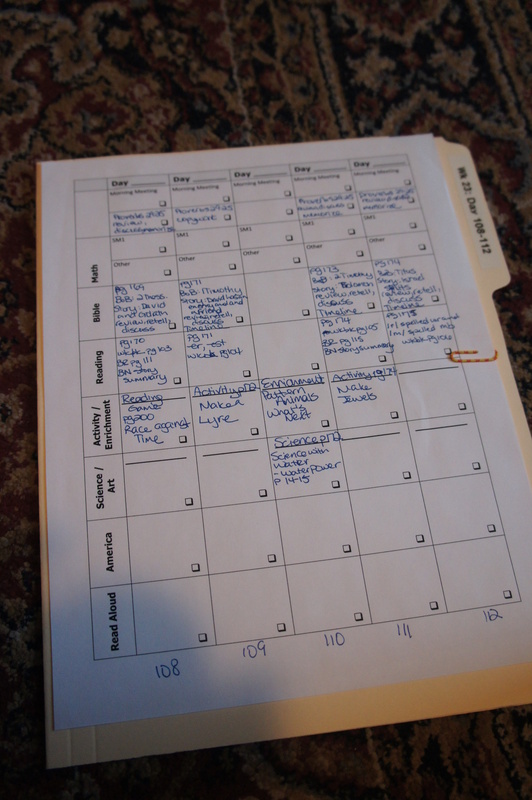 And here is a copy of my planning template. The one for our youngest is only slightly altered. I did all my lesson planning on these charts. This is a simple table created in a Word document. I’ve had some express interest in this document and so, I’m sharing it here. I can’t claim complete credit, since I adapted the idea I saw from someone else! With a bit of tweaking it should work for most any curriculum. I wanted to share some random homeschool pictures with you! Look! 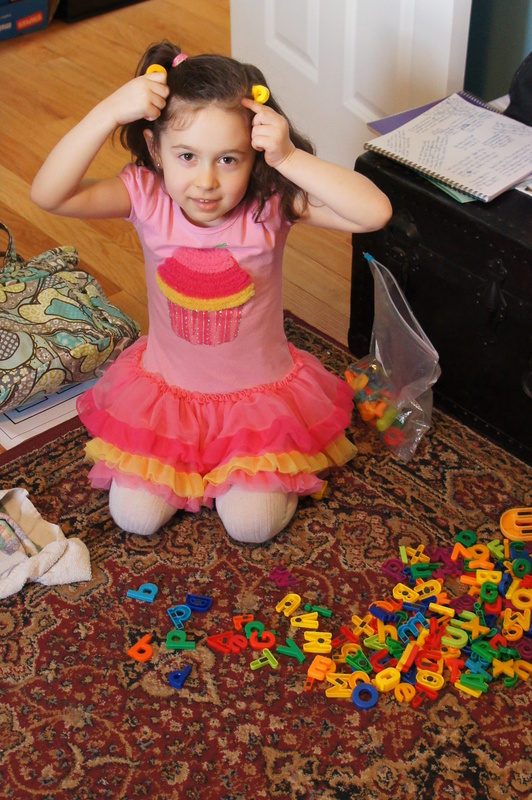 P is for Ponytails! On our final snow day! 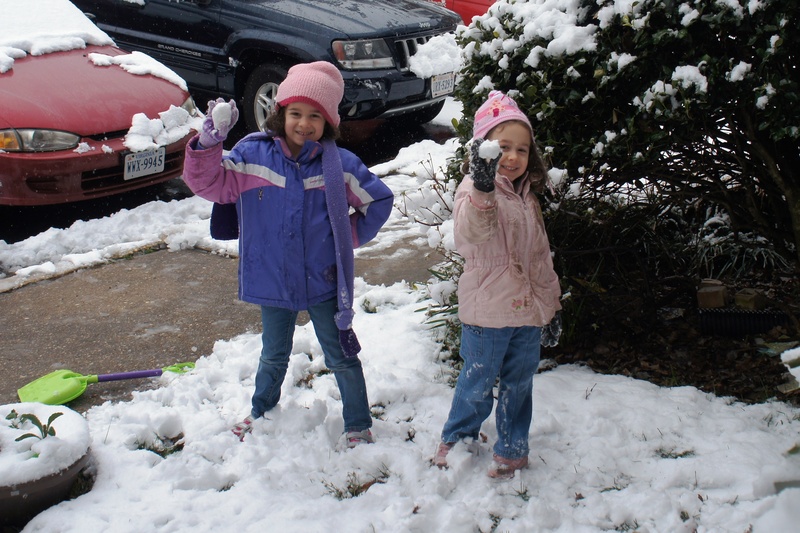 Since we had learned about 3-D shapes recently in math, we practiced by making Snow “Spheres” instead of Snow Balls! The girls actually got really into this, which was hilarious! I also convinced them that shoveling snow was fun. Go me! Umm, child, we home school. 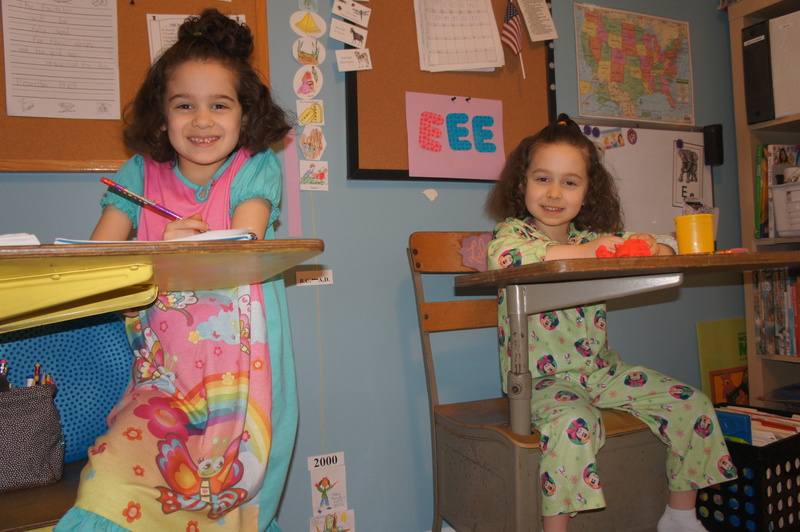 I don’t see why doing school in your pajamas is that exciting when we can do that every single day. But, whatever. You wanna a Pajama Day? We’ll have a Pajama Day. And the rest of these pictures are just for fun! 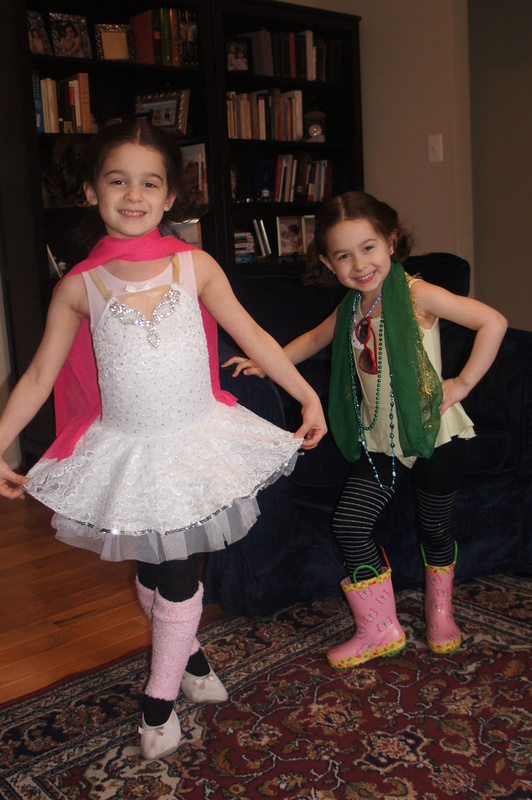 My girls are serious fashionistas. We have bins of dress-up clothes and I never know what I’m going to see next. 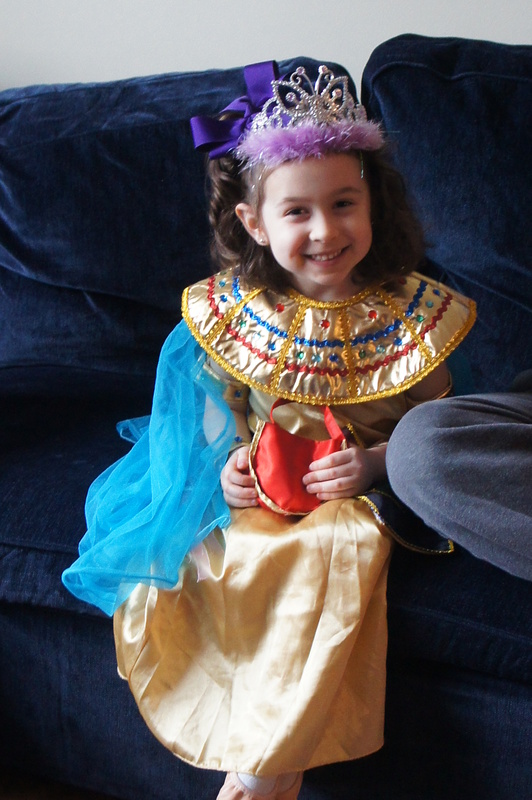 Here is the Egyptian princess who found baby Moses. Obviously, a princess needs a crown. (You just have to imagine that with a four-year-old valley girl voice to get the full effect.) And I think the purple bow just makes the outfit, don’t you? Oh, and this is how I was greeted one day. Some serious style, happening, no? One of my absolute favorite things about homeschooling? 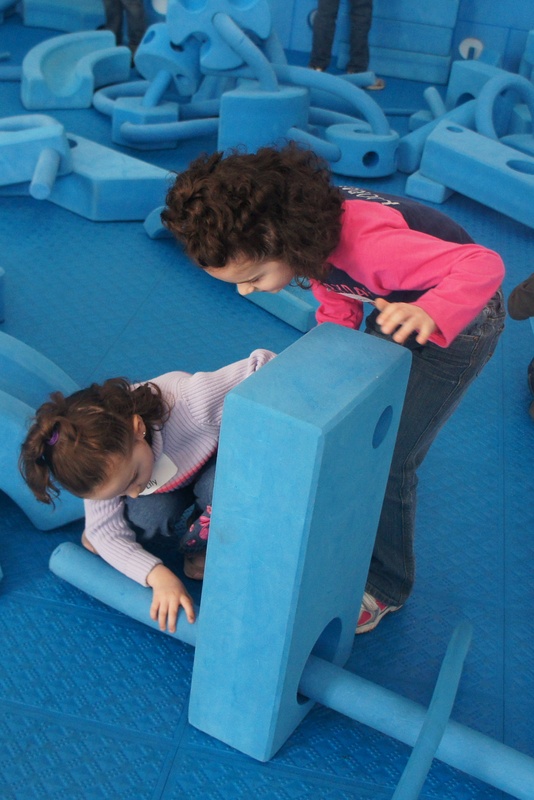 The National Building Museum had a “Homeschool Day” in March, complete with multiple classes for children to participate in. 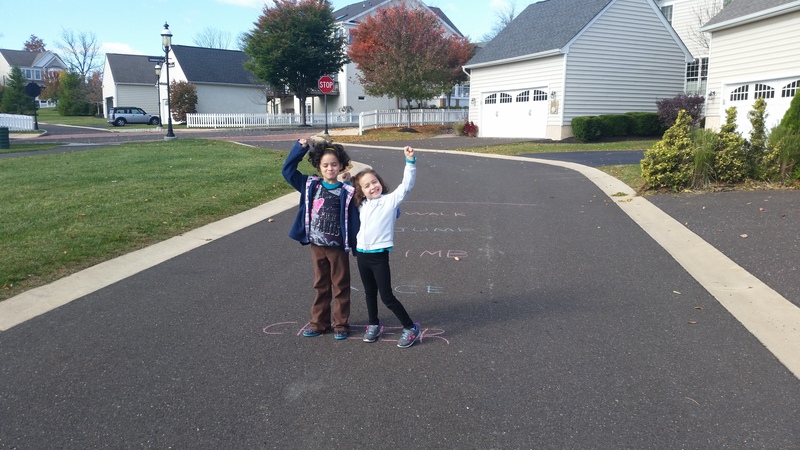 We chose a class called “My House, My Home” that both girls could attend at the same time. You do NOT want to drive there. Take the Metro. It’s right across the street! 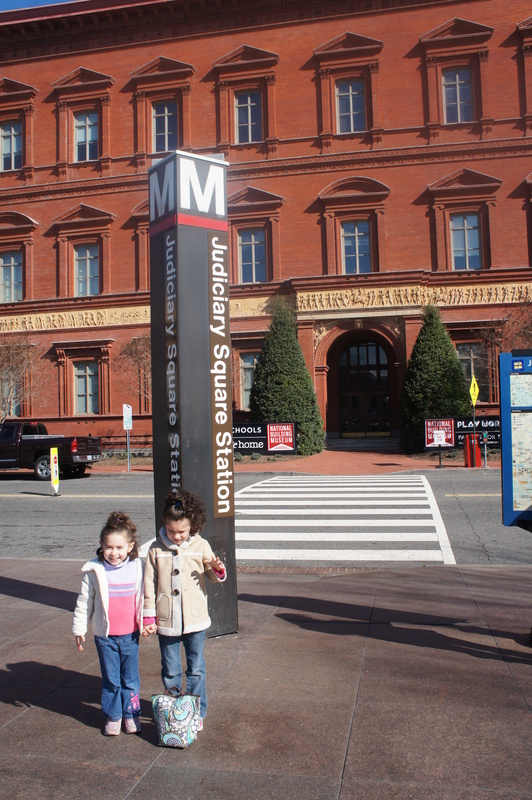 And my girls consider a ride on the Metro a field trip in itself! So, the girls took their class. And blessedly, they informed me that they were “too big” to have me go in with them. Which means I got to spend an hour and a half sitting in the coffee shop. Drinking a cup of coffee all by myself. In peace and quiet. For an hour and a half. The price of the class (just $9 per child, I believe) also included admission to the museum (this is not a free Smithsonian museum, sadly). 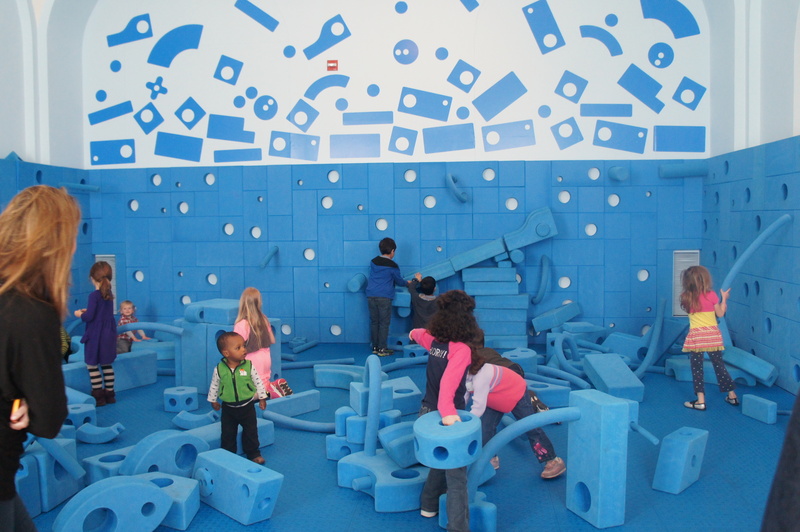 So after eating our snack lunch in the large open atrium, we headed to one of the open play rooms! 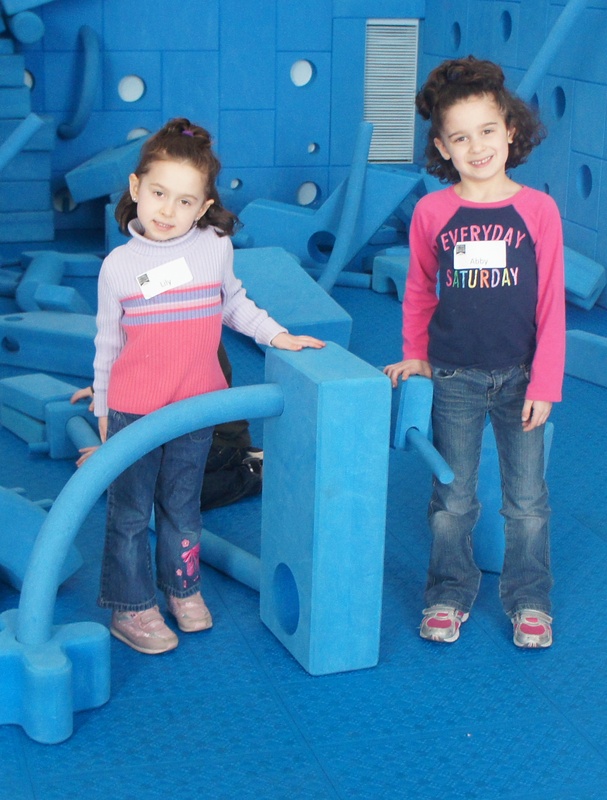 The girls could have easily played in here for hours. Their finished project. 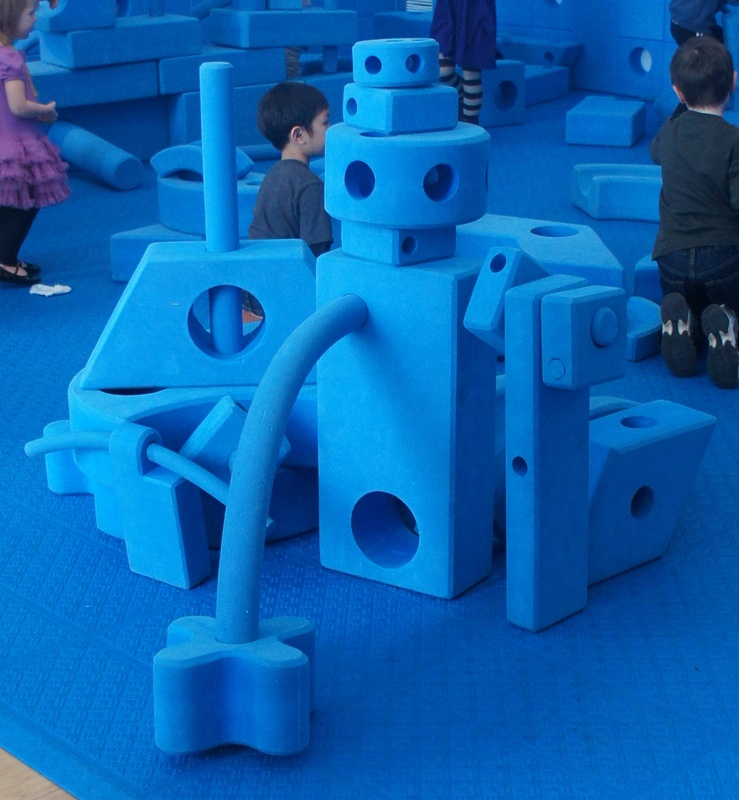 It’s a princess castle. With a moat. Can’t you tell? I bet My Father’s World Kindergarten curriculum users will recognize these! Yes, in a museum display case! How funny is that??? It’s really to bad that we had to leave early for me to get back to work. Next time, hopefully we can sign up the girls for more “classes” and spend the day. 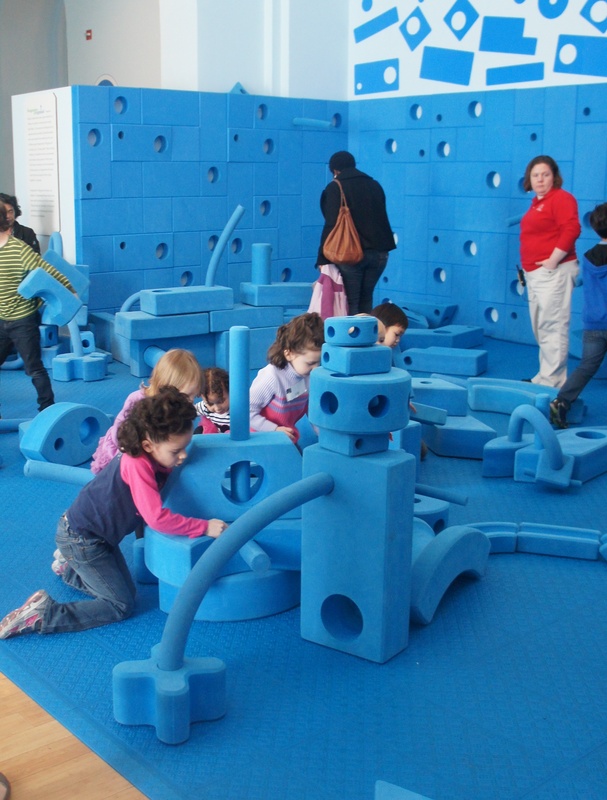 The concept of how to organize curriculum — ahh, the age old question, right? How in the world to do it? When I started to homeschool, I didn’t know that was such a big discussion! I just started to follow the directions and that was that. 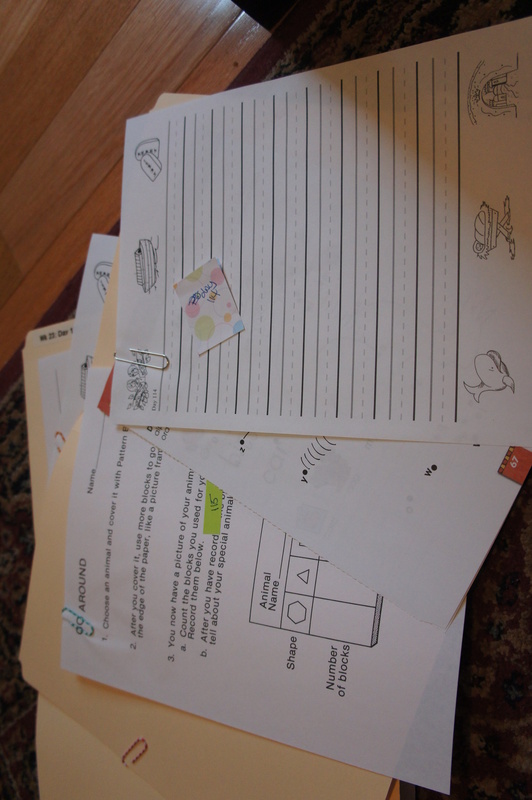 My Father’s World Kindergarten suggested organizing in a folder for each “unit” (letter). That averages about one folder a week. 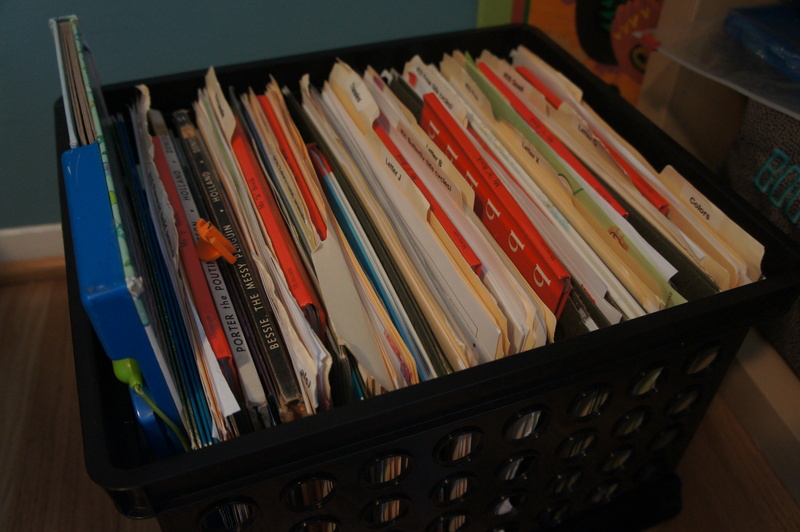 Then to make it easier on myself, I added whatever books/extra I found for each unit I just added behind the folder. When it was time to get organized for 1st grade, however, I was stuck. What to do? Now I will admit I did take this a bit overboard when organizing, but we were looking at starting 1st grade in a hotel room, remember? So, eliminating any excess and being super organized were the order of the day. But even now that we’re getting closer to the end, I’m still enjoying that craziness! What I did was clip all the pages together for each day, and put a tiny post-it on it so I’d know which day that work went with. Really, MFW 1st grade doesn’t have that many loose items, especially toward the end. However, this was very useful when I added in any “extras” – our math curriculum worksheets, or any science pages, etc. And what is making 1st grade so easy for me during this chaotic year? NO THINKING. After reading other blogs, I really like the idea of having a grid to work with. And yes, the new revision of MFW’s 1st grade now comes with a grid. Oh well, worked on this for ages, and this is what I came up with. I clipped this to the front of each week’s folder. Actually, this is a picture of an earlier version of my grid. I think I changed it 3-4 times this year to get it the way I really liked it. 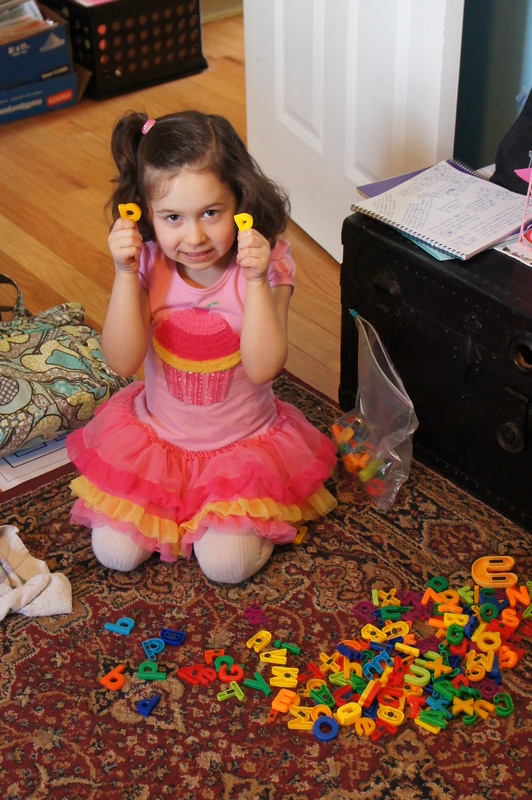 And now that I’m combining two years of homeschool with K and 1st, I need EASY. So now, I can just look at the folder and know exactly what comes next. I’ve got little checkmark boxes on each thing, so I can mark off when the assignment is completed. 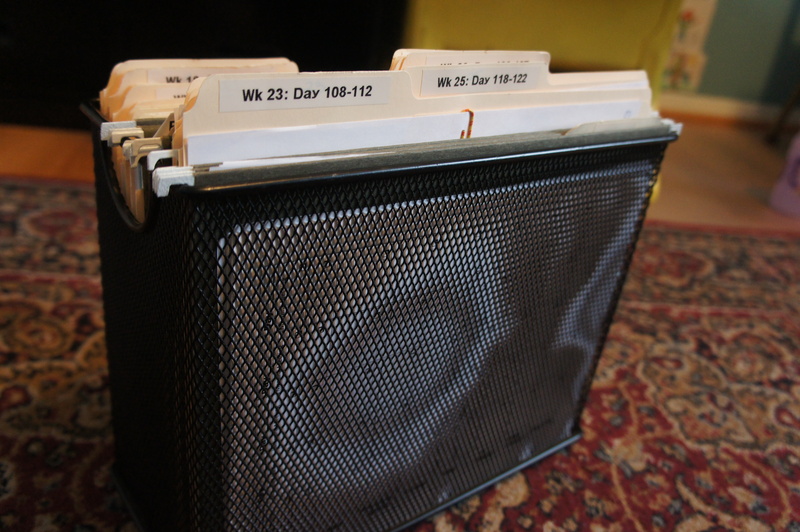 I have a date box at the top, so I can write down the day that we actually did that work, for tracking purposes. At the bottom I wrote the number of the day according to the curriculum, so I could go back and refer to the teacher’s manual when I needed to. 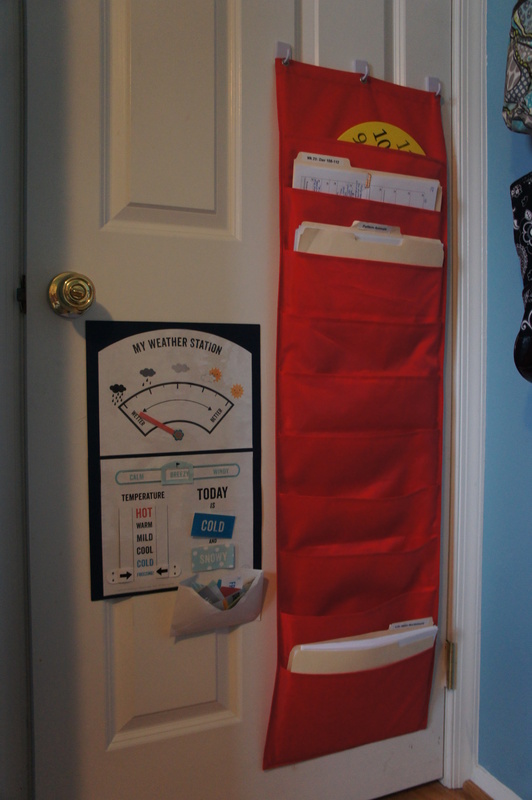 And then, the folders we are currently using (along with with any books, etc) are hung on the back of the door. 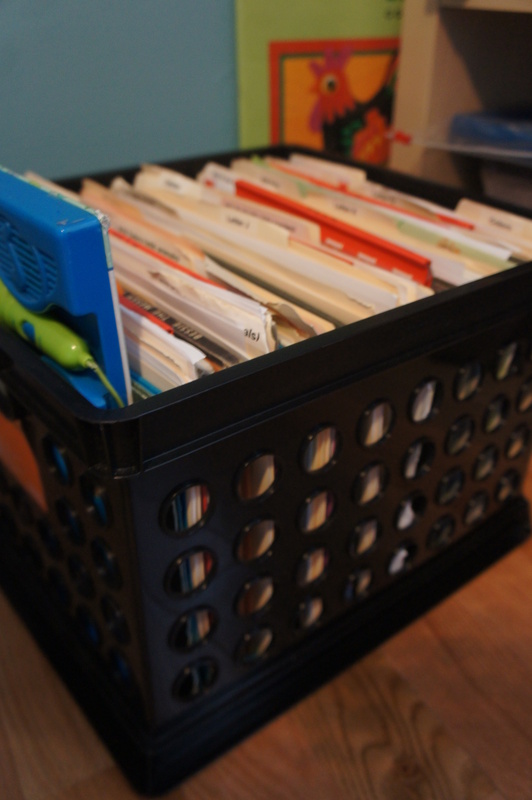 The folder system has really worked out great for us, and I plan to keep with it! Recently, I had a work project that I couldn’t delay any longer, but I didn’t want the girls to get behind school, either. Which is when I remembered we hadn’t pulled out Peter and the Wolf yet! First up, we watched the old Disney cartoon set to the music. Man, I did not remember it being that scary, but it actually freaked my youngest that is 4 1/2 years old. She didn’t last but a few minutes, instead she preferred to listen to the recording on its own. 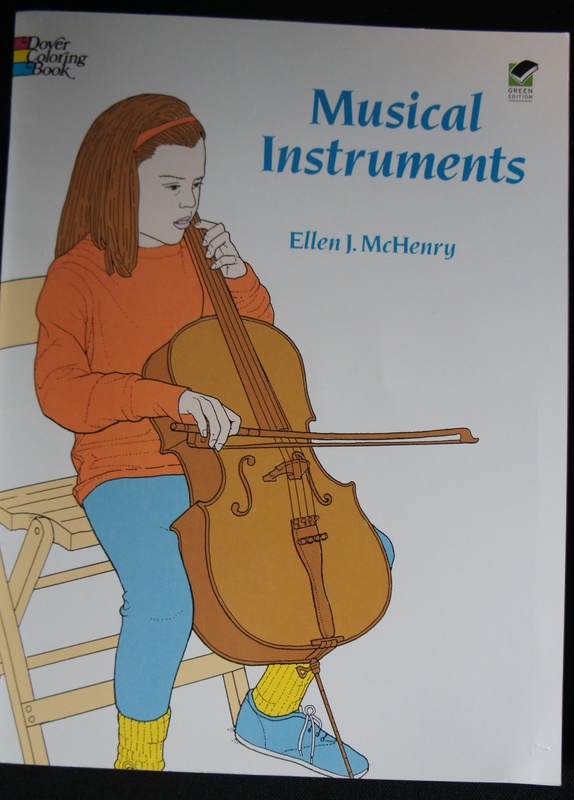 And then, of course, I made copies of the right instruments out of this book. 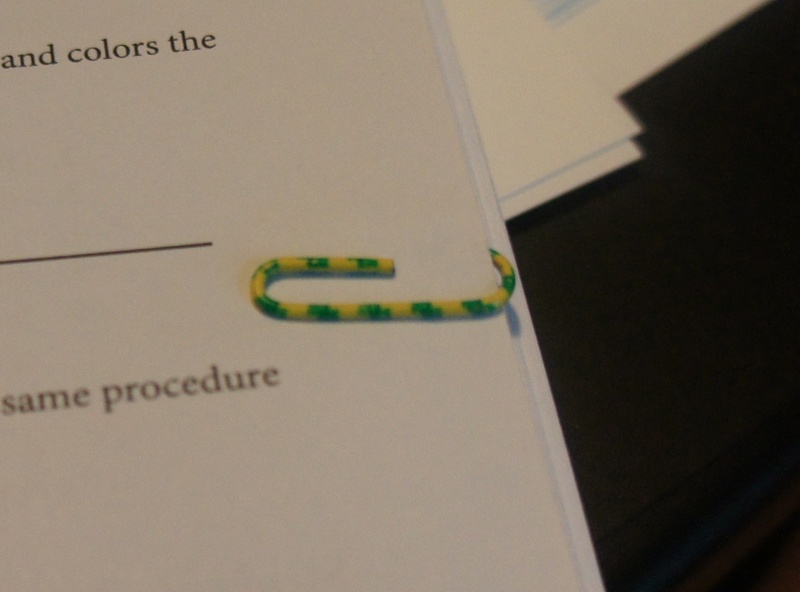 Stapled the completed pages together to make a cute little book, and voila! Music appreciation unit lesson done! 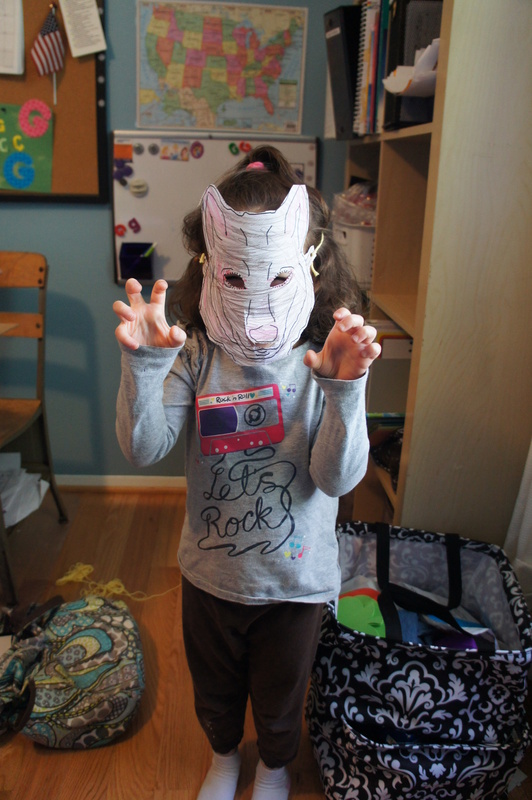 Oh, and this is how my youngest greeted the babysitter at the door later that day. She really deserves a raise, I think.